Part memoir, part how-to, all Baxter Black, Lessons from a Desperado Poet is a humorous, witty take on making a living by doing the right thing and trying everything. According to Baxter Black, success “does not require a genius; it just requires the persistence of a glacier. Remember, often it’s not ability that gets you ahead, it’s reliability. The world is run by those who show up.” A mind-tickling romp through the formation, fermentation, and fruition of the author’s career as a poet in a country where publishing poetry is “practically illegal,” Lessons from a Desperado Poet boldly injects a poem now and again when it is relevant, just to prove a point! It’s instructional for the entrepreneur, inspirational for the ambitious, and entertaining for the teeming masses. 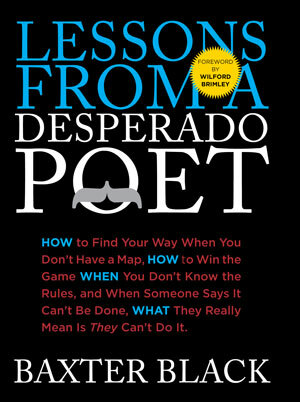 Since it is also a story of continuously overcoming the odds, Lessons from a Desperado Poet leaves a trail of self-improvement and motivational tortilla crumbs that readers will follow with delight—before, that is, squirreling them away in their own cerebral pockets for later use.